Months before our trip to Taipei, the fishing boat incident happened. Our flight was canceled indefinitely and we had to wait until the Taiwan government allowed Filipinos to enter their country again. It was barely a couple of weeks after their government gave the thumbs up when we decided to go there. Though we look Chinese, I was still contemplating if it is safe and if we would tell the locals that we are from Manila. As it turned out, our trip to Taipei surprisingly turn out to be a fun one. Just like any other trips, I came up with an itinerary but this time around I made sure that it would be flexible enough for changes since we'll be meeting up with three of my cousins who are siblings, they've been living in Taiwan for more than 10 years. On our first day, after getting lost and asking around, we made it to The Miniature Museum of Taiwan. 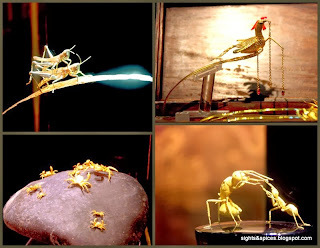 I haven't been to an exhibit like this, it is really an interesting place to visit. 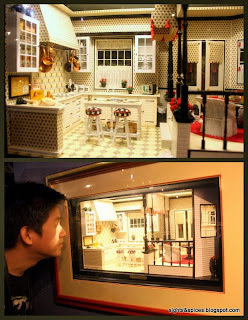 We had fun looking at the different miniature displays, the attention given to even the smallest details was amazing. 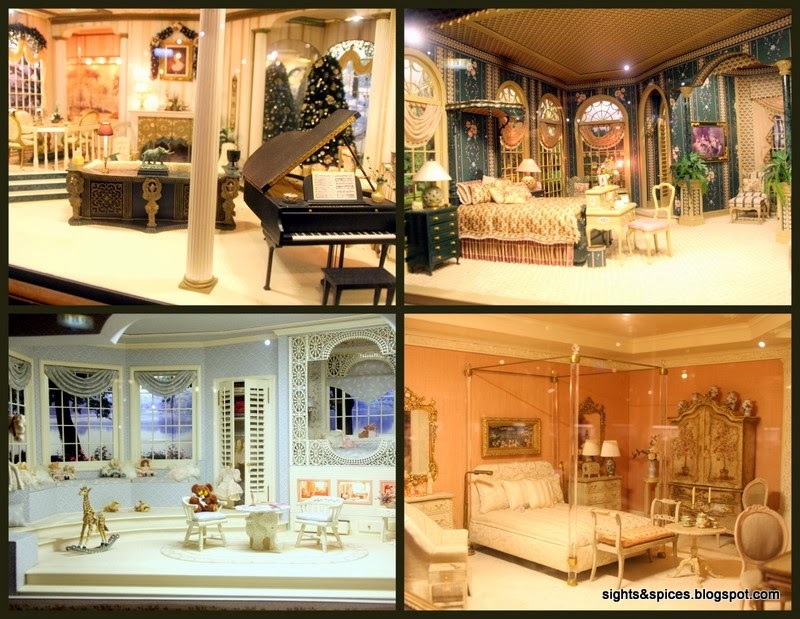 We were told the owners of the miniature pieces have gone all over the world to build up their collection. 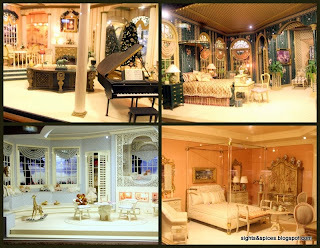 Some of the figurines are smaller than my pinky. Among the displays, these are some of my favorites. It started to drizzle but it didn't stop us from heading to Simending area. We went there to specifically to dine in Modern Toilet but we ended up walking around checking out boutique stores and pigging out at the numerous food stalls. To complete our first day we visited the most famous landmark in Taipei, the Tapei 101. Named as such because of the 101 floors, it used to be the tallest building in the world. I've been to different tall structures that have observation decks before and each place has its own charm. We arrived in time for the last admission to go to the observation deck. 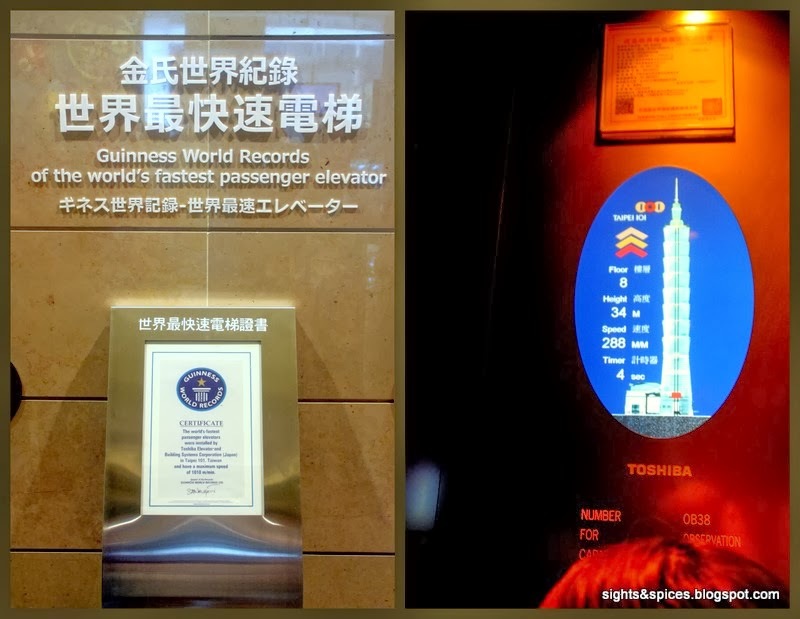 Riding in the world's fastest elevator. The humongous 660 ton spherical steel pendulum. The steel ball was made to protect the building from strong gust of winds and earthquakes. The mass damper will sway against the opposite direction and balance out the structure thus protecting it from breaking. On the 91st floor, there was an outdoor observation deck. 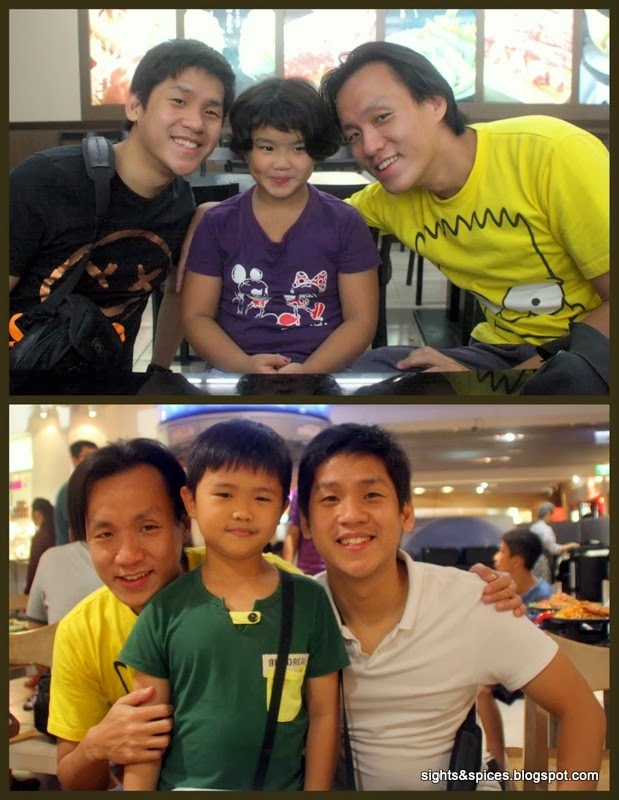 The next day, we were picked up by our cousin, Ahia Benjie to go around Taiwan. Luckily for us, he is a local tourist guide. Our first stop was at the Yehliu Geopark. It was really an interesting place, this was the first time I've seen rock formations called hoodoo. Some are tall and some are short, it's really up to your imagination what shapes you see. Though at the entrance, there are pictures of the rocks posted and captions on what they are supposed to be shaped like. As these are all natural, these rocks will change its shape from time to time. Being the logo of Yehliu Geopark, the Queen's Head is the favorite rock formation of the lot. On our next stop, we had to drive all the way up to the mountain top to visit the Jinguashi Gold Ecological Park.We had to walk a few yards to reach the Gold Mine Museum and Park, I didn't mind walking since the place offered a nice view of the mountains. Unluckily, the gold mine museum was closed that day but beside it was an exhibit hall. Inside the hall, there was a display of items used for mining and you'll be surprised to find out the different uses of gold in common items that we use. I particularly enjoyed looking at the different intricate gold sculptures. ...how I wish I can take it home with me. Just a couple of minutes away by car was Jiu Fen Old Street. A busy alleyway filled with food shops and souvenir stores. There were a lot of tourist around and the place exudes of the local old culture. We had fun walking, looking around, tasting food and chatting with the friendly store owners. 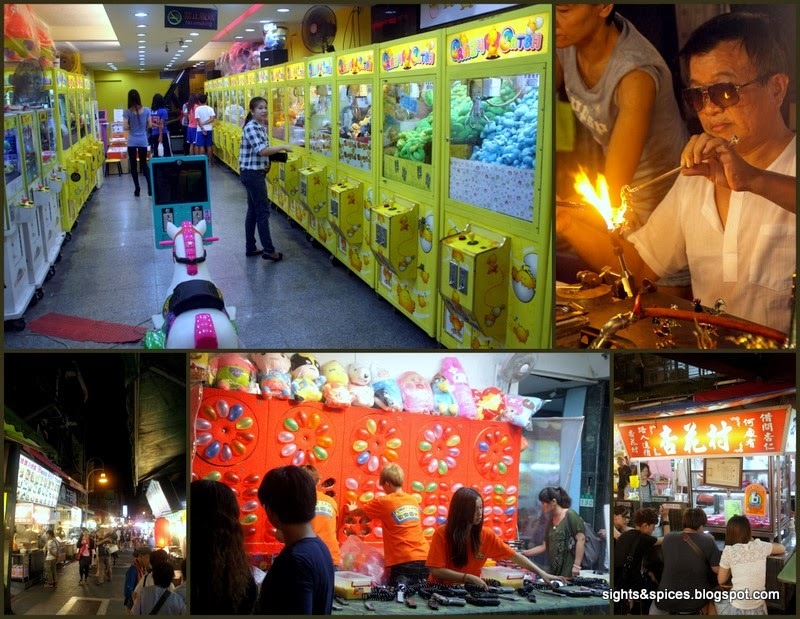 There two famous night markets that locals and tourists flock to in Taipei, Shilin and Raohe. 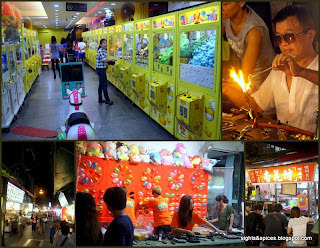 Practically you can find the same things in both night markets though Shilin had a more young and hip vibe while Raohe had a traditional old feel. We met up with Achi Angie and she gave us a tour around Shilin, she practically knows every nooks and crannies. She even treated us to scrumptious food that is being sold around the market. 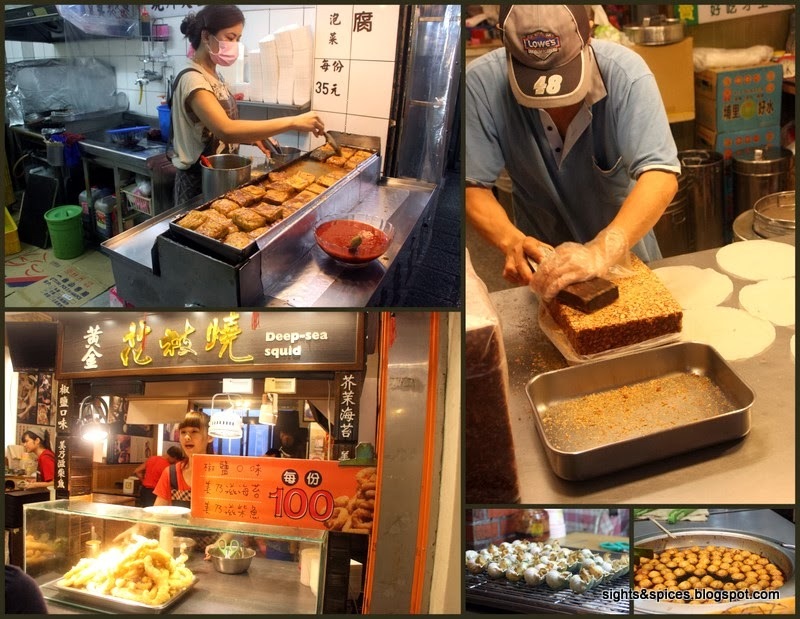 One of the interesting thing we found in Shilin was the Fish-a-shrimp stall. What looked like something kids would do, I was surprised to see adults seriously concentrating on fishing out shrimps. Catch one and the store vendors would put it on a skewer and grill it for you to eat. After having lunch at Barbie Cafe the next day, we headed to Taiwan's National Palace Museum. The huge museum's facade looks magnificent and beautiful, inside are more than 500 thousand pieces of relics and artifacts. I strongly suggest people to look at the museum's map beforehand and head for the exhibits they are interested in. To be honest, we didn't enjoy it much here but for those who wants to learn more about Chinese history and culture, it's a good place to visit. Taking pictures inside is not allowed. On our last day in Taiwan, Ahia Charlie took us to go hiking up one of the four Beasts Mountain. Before heading up the mountain, we passed by a Japanese Memorial Garden to have a look around. There were old Japanese structures built around a beautiful garden filled with plants and trees. Since we didn't have much time, we decided to start at the halfway mark going up Tiger Mountain. It was relatively an easy climb, most of the paths are paved in concrete. We had to climb up and go down numerous flights of stairs and it took us roughly around an hour or two to go to and from. There were a lot of people we met along the way. Mostly old folks and kids were hiking, there were even dogs walking along with their owners. As Ahia Charlie pointed out, these is one of the favorite leisure activities the old folks do in Taiwan, no wonder it looked so easy for them. There was even a foot reflexology area were one can go barefoot to walk on the stones, it actually felt quite nice to walk on it. The last thing we experienced in Taiwan was watching the sunset while basking on the soothing sunlight and enjoying the breeze. I must say that this pretty much sum up what I felt about our trip. Taiwan is a modern first world country but still it had a easy go lucky laid back feel to it. The locals were leisurely walking around going about their daily routines, people here seems to be in no need to rush. If there is one thing that I'll always remember about Taiwan, it is definitely the people. Everybody was so nice, kind and helpful, I felt silly worrying about telling people where we're from. Whenever we talked with locals, they would always ask where we are from and upon saying that we came from Manila, warm welcoming smiles greeted us. This alone is enough reason to go back. **I'd like to thank my cousins, Ahia Benjie, Achi Angie and Ahia Charlie for taking us around. Thank You! One of the highlights of the trip was meeting our seven year old niece, Lian and six year old nephew, Daniel. They are so adorable and cute! We had fun trying to converse with them in Mandarin, playing and joking around with them. If you're planning to go to Taiwan. 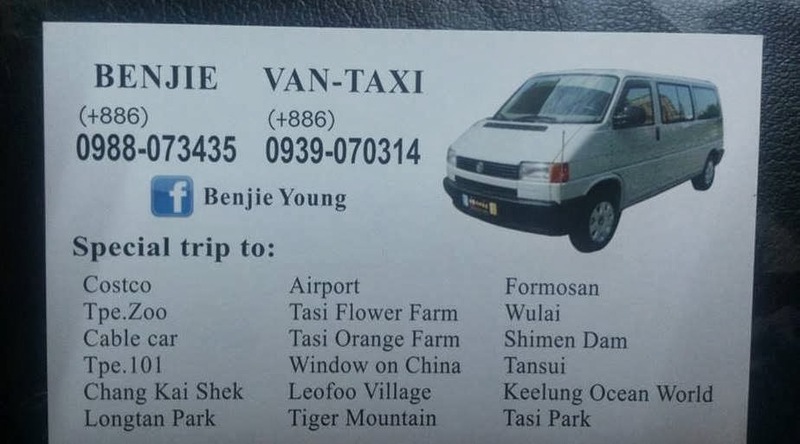 You can contact Benjie Young for airport transfers and tours around the country.